Charlotte Geyer of Mount Gilead turns 100 years old Saturday. 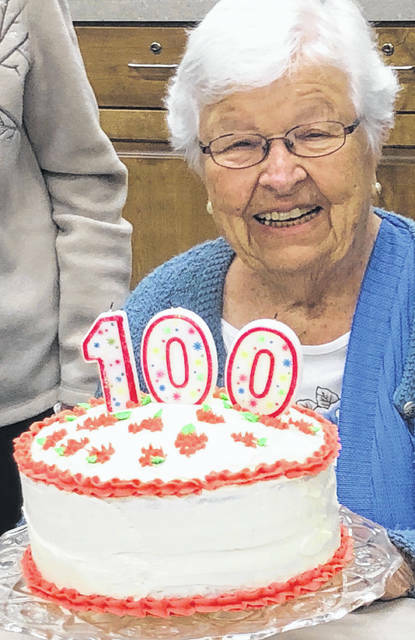 Charlotte Geyer of Mount Gilead turns 100 years old Saturday, Jan. 26. There is 99 years between her and the youngest great grandchild. Charlotte has never let age define her and she always enjoys new adventures. At age 70 she took-up golfing for the first time. At 75 she traveled to Italy and at 81 she took her three kids and their spouses on an Alaskan Land and Cruise Tour. When she was 85 her son took her on a 50-mile ride on the back of a scooter and at 90 she took an airboat ride in the middle of the Florida Everglades. Charlotte has always loved to play cards, especially double solitaire, and dominos with her friends and family both in Mount Gilead and in Frostproof, Florida, where she typically winters. She also loves to crochet and has made hundreds of lap robes that she donates to the veterans of Morrow County. Charlotte is the mother to three children; Tom (Diane) Geyer, Pat (Don) Staley (both deceased), and Pam (Rod) Clinger. She also has numerous grandchildren, great grandchildren, and great great grandchildren. Happy Birthday Grandma. We love you.